Set up your bedroom stylishly with beautiful Scandinavian posters. That looks very different and gives a nice atmosphere to your bedroom. Nordic brands only. 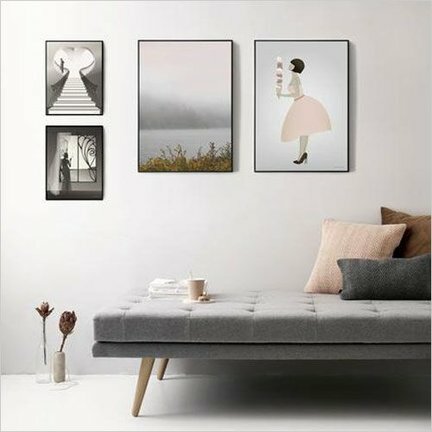 Hang a few beautiful Scandinavian posters in your bedroom and it looks stylish and dressed up right away. We have a wide choice of posters for you. Of course all Scandinavian design. For example, what about Vissevasse? For a somewhat artistically decorated bedroom. Or the faunascapes of WhatWeDo: beautiful images of animals and landscape in one. And the floating leaves of MOEBE fit perfectly in a green, botanically decorated bedroom. Choose a poster in the style that suits you and enjoy the beautiful atmosphere in your bedroom. Stylish Scandinavian living Tooltip Scandinavisch design past in ieder interieur.